Giving Old Friends the second chance that they deserve. A New Home For Thor! Ellen Hockley Driving Clinic. Oct. 14-15,2017 Photos! Check Our Store Out on Facebook! Champagne Fall Finale Schooling Dressage Sunday Oct 1., 10 am. 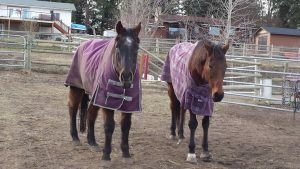 As a special feature we are doing a ‘blanket’ sale- many have donated some great blankets in the last few weeks-so we have been busy washing and mending.We are pricing things very reasonably so they will be $2-$10…so bring your toonies and come browse before or after your dressage test…no need to ‘break the bank’..just a little mending is all most of them need. Lots of other great deals in our store. Come for a fun day, see what Old Friends Canada is all about and support the horses. Thanks! Blanket Sale At Our Oct. 1 Show! Halloween Costume Class Added to our Fall Show!!!! Halloween Costume Class added to the Champagne Fall Finale Show! !